If you haven’t thought about maximizing the best potentials out of your kitchen as a focal space of your property, you may want to rethink your business choices. The market appears to demand more and more out of the kitchen, these days. But beyond that, kitchens are the space where the future seemed to be headed. It’s no longer fancy living rooms equipped with smart entertainment devices or bathrooms with open ceilings. Today, kitchens rule. A fascinating finding was discovered during the London Design Junction. They mentioned that it was the Kitchen of 2063. A technology would scan a part of our body—our hand—and analyze us. The tech would then measure our body’s nutritional needs simply gathered by the data it receives from our hand. Ideally, the 3D technology would then propose to us a recipe according to the information they gathered. This seemed to be the stuff they always show at sci-fi fantasy. That is, it is fictional. However, the designer, Miele, thought that this may just be the norm in the future. And that’s not the only thing on the future of the kitchen. The future kitchen in London Design Junction is said to ideally be harnessing the energy that is renewable to mankind. And ideally, the major source of energy for this is none other than the sun. There would be solar blocks that are glass-like. These solar blocks would let the light to the inside of the kitchen and it would not only power up the future kitchen, but also the entirety of the house as well. 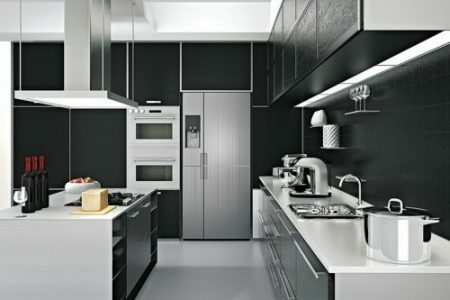 A self-sufficient kitchen is something an ideal future kitchen would have. An aquarium-like compartment would be one of the most striking features these future kitchens have. Ocean fishes and the vegetations of the seas are going to be grown in these aquariums. This takes gardening and farming to the next level due to the complexity of this. But the aesthetic value of this breathtaking idea displayed just how much the artistic elements played an important part in this whole future kitchen plan. All in all, a very fascinating concept.